Refresh your hair with the H2O+ Beauty Sea Greens Shampoo; a fragrant formula that cleanses locks gently and effectively. The shampoo effortlessly lathers upon contact with damp locks. 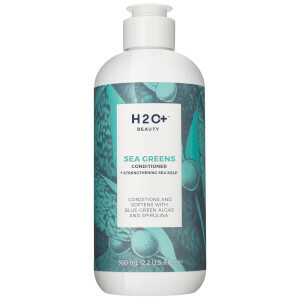 Its formula is enriched with Sea Lettuce Extract, which eliminates daily dirt, oil and impurities, whilst Sea Kelp and Blue Green Algae Extract provide additional nourishment to soften the fiber. Imparting a refreshing botanical scent, the shampoo leaves tresses thoroughly cleansed and ultra-shiny. Apply to wet hair, lather, and rinse well. Follow with Sea Greens Conditioner.